Iovsoft MP3 Cutter for Mac, as a best MP3 Cutter for making ringtones on Mac OS X, it can easily cut MP3 musics or large MP3 files to melody by setting beginning and ending time easily. And it supported batch conversion, you can input any amount of MP3 files to set well for cutting at one time, don't need to set one by one, or input the MP3 files folder. Besides MP3 cutting function, it can also convert MP3 to AAC, WMA, WAV, M4A, AIFF, AC3, MP2. ...... etc.. With Iovsoft MP3 Cutter 's cute and easy-to-use interface, just a few clicks to convert audio! Welcome download for free to have a try! 1.Best MP3 Cutter for making ringtones on Mac OS X.
Iovsoft MP3 Cutter for Mac, as a best MP3 Cutter for making ringtones on Mac, it can easily cut MP3 musics or large MP3 files to melody by setting beginning and ending time easily. Output excellent melody for iPone, BlackBerry or any other cell-phones instead of downloading ringtones to your phones from sites online,. it supported batch conversion, you can input any amount of MP3 files to set well for cutting at one time, don't need to set one by one, or input the MP3 files folder. 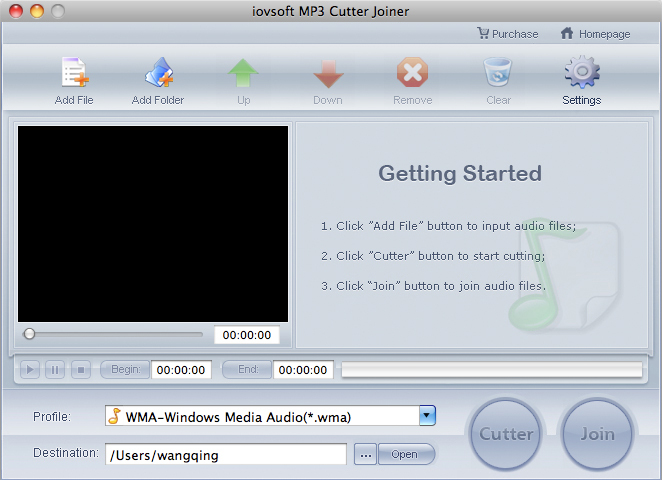 Qweas is providing links to iovSoft MP3 Cutter Joiner for Mac 6.5.8 as a courtesy, and makes no representations regarding iovSoft MP3 Cutter Joiner for Mac or any other applications or any information related thereto. Any questions, complaints or claims regarding this application iovSoft MP3 Cutter Joiner for Mac 6.5.8 must be directed to the appropriate software vendor. You may click the publisher link of iovSoft MP3 Cutter Joiner for Mac on the top of this page to get more details about the vendor.